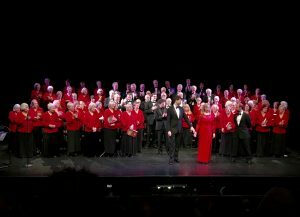 This December ACS has supported three local charities; our concerts on the 1st and 8th December have raised over £1,500. Thanks to everyone who came along and supported. The Besom – based in Ashtead, The Besom provides a bridge between those who want to give time, money, things or skills and those who are in need. the likes of Thomases Weelkes, Morley, Tomkins, and Vautor, among others. Stephen Ridge, who gave first class support throughout the evening where needed. nuanced ‘Silent Noon’, and David Robinson’s flawless rich bass ‘The Vagabond’. Sarah Coulam’s soprano solo over the choir was hauntingly glorious and peerless. of booking a cruise …) – ‘As Vesta was Descending’ and ‘The Lady Oriana’. performance of the old folk song ‘The Oak and the Ash’. the songs in which willow trees witnessed tragic goings on. 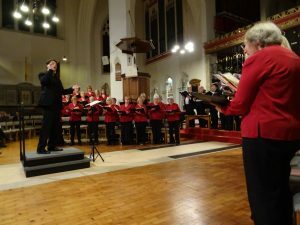 Ashtead Choral Society is pleased to announce it has appointed a new Musical Director – Andrew Storey. Read more about Andrew on the profiles page. 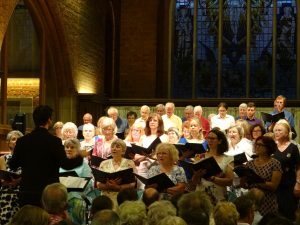 Bravo to maestro James Henshaw for a most challenging concert which progressed Ashtead Choral Society in their skills singing a capella for all but the Fauré pieces and also adding short items in Russian and old French to their linguistic repertoire, as well as including pieces in Latin. 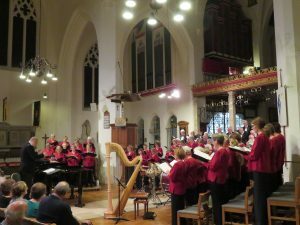 The singers showed a much developed sense of collective confidence and cohesion, in addition to well controlled pitch and secure technique. The evening comprised music in French and Russian composed in the late 19th and early 20th centuries, the alliance between these nations ending with the Russian revolution of 1917. The concert bookended parts of Fauré’s Requiem with pieces from Rachmaninov’s All-Night Vigil, four in all. The hushed tones of the Introit of the Requiem set the scene for an evening not without its musical fireworks. The Rachmaninov movements started with quiet moments building gradually into very strong fortes, particularly ‘Praise the Name of the Lord’, the penultimate number where the forte was withheld until late on then faded. Two of these pieces gave us access to the dark toned Russian ‘Allilúiya’, quite a contrast to the bright ‘Hallelujahs’ we are used to from say Handel’s ‘Messiah’. The Russian sounded largely secure, with good support from the basses. Duruflé’s 4 Motets were sung assuredly by the choir with crystal clear voices, and special mention must be made of the ladies only song ‘Tota Pulchra Es’, which was wholly beautiful and immaculate. The first half ended with a gorgeous rendering of Fauré’s exquisite ‘Cantique de Jean Racine’ which left the audience wanting more, rather than having a break. Organist Jonathan Holmes played sensitively in the Fauré as well as shining in two solo items of Vierne’s Organ Symphony No 5, the Scherzo in the first half and a mighty Finale putting the queen of instruments persuasively through her paces. In the second half we were treated to ‘Trois Chansons de Charles d’Orléans’ by Debussy, challenging in the old French and musically too; the first a paean to the poet’s love’s graceful beauty; the second in which ACS alto Caroline Bailey sang suavely and coquettishly while others in the choir provided complex tambourine-like rhythms; and the third a high speed lament for the villainy of winter! The choir met the challenge with aplomb! The final three pieces from Fauré were splendidly rendered and special mention must be made of ACS bass soloist Richard Price whose heartfelt involvement with the text really had one in earnest hope for his eternal soul. The peaceful ‘In Paradisum’ brought the evening to a satisfying calming conclusion. 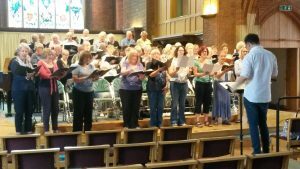 The wonderful acoustic of the church contributed greatly to the choir’s well blended sound with the voices in most agreeable balance. The variety of rhythms, some very complex, exploitation of dynamic range and ensemble left one indeed grateful for such a tremendous experience. The ACS Summer Concert with Ashtead Jazz Club will be on Saturday 17th June.